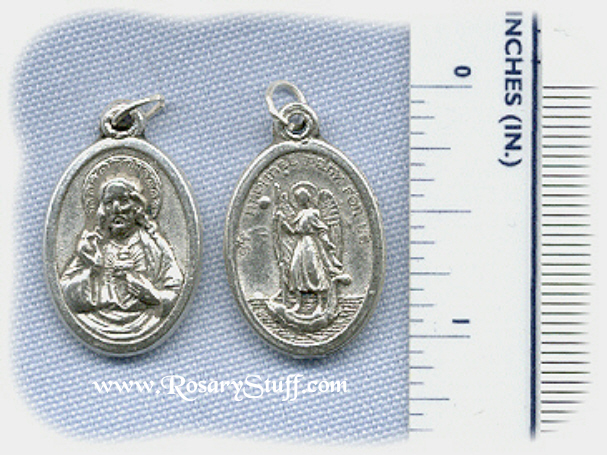 This Italian made, oxidized silver plate St. Raphael/Sacred Heart medal is about 1 inch tall. Not only is this medal beefier than most others I have seen, the Sacred heart image is more of a 3D version than normal. Christ's head actually comes out of the medal. This particular medal came to me as a shipping error, but I loved it so much I decided to keep it. For more information on St. Raphael the Archangel, please click here. To help with size clarification, it is pictured next to a ruler showing inches as well as millimeters.